U-Boat Worx do everything possible to give all sea fans the best and safest diving experience possible. Since their start they have grown to become the largest private submersible builder in the world. 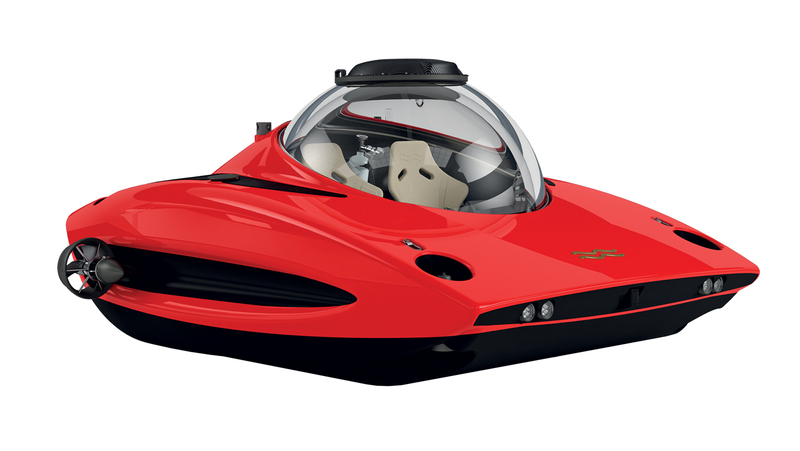 Their large fleet consists of nine different models and has changed the standards for private submersibles. The Netherlands is a country renowned for its marine engineering and this heritage continues with a company specialized in the construction of small submarines jewelry: following a vision to create personal submarines that make access to the subsea readily available, Bert Houtman has realised his dream founding U-Boat Worx in 2005. Since the first model, U-Boat Worx has grown year on year and evolved to become the largest builder of private submarines. The wide range of U-Boat Worx models includes manned personal submarines that can accommodate from one to nine people and operate to depths of 100 meters up to 1,700 meters. U-Boat Worx is dedicated to continuous support and growth within the global market for manned submersibles, whether it be for individuals, commercial/research/scientific survey or underwater film makers. Betting on innovation and in-house engineering, that have led to many “world-firsts” and achievements, U-Boat Worx is the only submersible manufacturer who builds in series. The benefits of this approach are straightforward. Their customers enjoy the best quality, highest reliability and design at industry-defining prices. The engineers and technicians in the Netherlands-based factory take individual care of each submersible assuring the highest level of precision and craftsmanship, to provide customized solutions for a particular mission or a bespoke design. To make unique the diving experience, both exterior and interior can be customised according to personal taste, making each submersible an individual and bespoke statement. Standard seating can be reconfigured, and if desired, a lounge or partitioned pilot area – even a toilet – can be incorporated into individual design requirements. U-Boat Worx are globally recognised, gaining numerous industry accolades including the prestigious “Red Dot” Design Award in 2015. U-Boat Worx has set the pace by producing a full and extensive range of models using its unmatched modular componentry. This has created submersibles fit for all purposes and conditions: a series of vessels to suit everyone from the private single enthusiast to the professional groups and anyone in between. The economies of scale have given U-Boat Worx a distinct industry advantage that is passed on to their customers who enjoy the utmost quality and reliability, backed by superior after-sales service. Every U-Boat Worx submersible is designed, engineered and built to the highest possible standards and registered with the leading classification society, DNV GL. In addition to U-Boat Worx’s stringent internal quality control and assurance procedures, every submarine is subjected to extensive and exhaustive testing including hydro-static pressure tests and material qualifications prior to in-house bench testing, followed by harbour then full sea trials before final delivery. The entire design and engineering function is carried out in-house by a highly experienced and professional work force. Using leading edge 3D design and FEM software, a team of expert engineers craft proven core components that are unique to the brand. The modular design philosophy provides for total flexibility to cater for each and every customer requirement. Testimony to Company’s achievements is catalogued with the following innovations: introduction of flexible ballast tank technology, enhancing performance and reducing storage space requirements; introduction of the Manta controller, allowing for supervised passenger operation; first fully certified manned submarines with Lithium-ion battery technology; introduction of the Marlin controller making for simple launching and recovery using wireless surface control. Above all, U-Boat Worx’s submersibles are designed for longer and lower-cost maintenance cycles. Advanced corrosion protection with interchangeable modular components and user-friendly practices are made for a safe and reliable ownership of every u-boat worx submersible. At the same time, each submersible can be equipped for any outcome and need. A full inventory of tools has been developed in concert with the modular system of construction that allows for upgrades to cater for any change in customer requirements: it’s possible to choose between a selection of professional 4K cameras with compatible housings, lenses, controls, recording and lighting devices to meet the most exacting specifications. Dedicated to underwater film-makers, a 360-degree camera offers a continuous 360-degree footage of any dive and the opportunity to record each moment for later replay and review, reliving the dive experience. If desired, each model can be equipped with a wide underwater lighting choice: a selection of the latest generation and high intensity lights are available to put the spotlight on centre-stage when the secrets of the deep appear. Moreover, external equipment comprising a selection of subsea robotic arms together with work platforms and collection baskets can be installed on most of the U-Boat Worx models. To thoroughly investigate and explore the recesses of caves or inaccessible wrecks, an optional fly out vehicle allows for close up observation remote controlled from within the submersible. A very useful instrument is the compact ultra-wide (130 degree) field of view Sonar that has a range of 100 meters acting as a second set of eyes when navigating the subsea terrain. Such as instruments for underwater tracking and navigation: a very advanced USBL system can be equipped to relays GPS data to the submersible’s on-board computer via integrated underwater modems; or piloting with real time positioning and supporting text data provides for a accurate and efficient navigation. And last, but not the least, the DVL (Doppler Velocity Log) delivers real-time ground speed and position data linking to the on-board computer system. For those who are looking for scientific applications, a Laser scalers is the best solution to measuring the size of marine life and other underwater objects: this operation is simplified by using the laser cursors for accuracy. Or the Fish feeder: for up close and personal observation, the fish feeder can inject bait to lure marine life into close quarters and provide an intimate environment with nature.